To celebrate the first #NewMusicFriday release date, progressive instrumentalists SCALE THE SUMMIT have debuted the first single from their new album V (Five) in the form of a satirical, '80s-themed music video! See what the band would have looked like in the glam-metal days and find out some interesting pop-up facts as you watch the video for "Stolas" HERE. The cover art for V was completed by the UK-based artist Duncan Storr, with whom the band previously worked on their 2013 effort The Migration. The artwork is a composite of images that each correlate to a specific track title, and over the past two weeks, the band has led up to its reveal with teaser snippets of each song along with its associated visuals via social media platforms. You can hear samples of each of the 10 tracks on the new album below. Mixed and mastered by Jamie King (BTBAM, THE CONTORTIONIST), V is now available for pre-order on CD and LP (including black, white and clear vinyl options) at www.prostheticrecords.com/scalethesummit. Digital pre-orders, which include an instant download of "Stolas" are also available via iTunes, Bandcamp and Amazon. 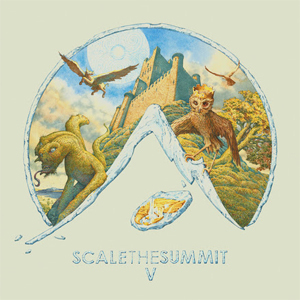 Described as "essential prog" by Guitar World, SCALE THE SUMMIT was formed in 2004 after guitarists Chris Letchford and Travis Levrier met while attending Hollywood's Musicians Institute. The group self-released their first album, 2007's Monument, before signing with Prosthetic for the 2009 release of their sophomore effort Carving Desert Canyons. That album earned acclaim from fans, critics and peers alike -- none more high-profile than former DREAM THEATER drummer Mike Portnoy, who asked the band to take part in the group's Progressive Nation tour that year. From there, SCALE THE SUMMIT supported the release of 2011's The Collective with rigorous touring with the likes of PERIPHERY, CYNIC, PROTEST THE HERO and more. With new bassist Mark Michell in tow, the band then headed to King's Basement Studios in North Carolina to record The Migration, their first effort to crack the Billboard Top 200. Described as “post-rock at its most melodic and dynamic best” (Alternative Press), the album was supported by extensive touring across North America and Europe with such notable acts as YES, INTRONAUT, TESSERACT and THE OCEAN, as well as appearances on several notable festivals (Yestival, SXSW, Cruise To The Edge, etc). Keep in touch with SCALE THE SUMMIT online!